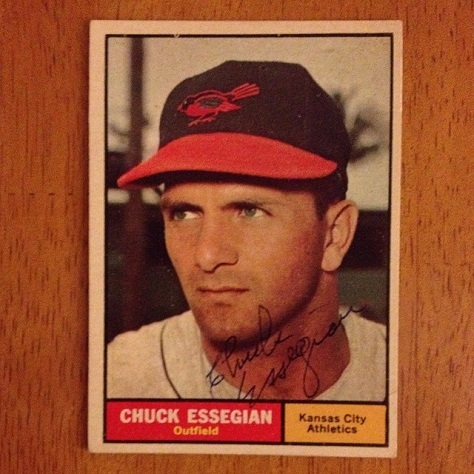 Poormans Stack	 02-21-2019 03-01-2019 Success 8 3/3 Signed 3 cards in Black Pen, Thanks Mr. Essegian. 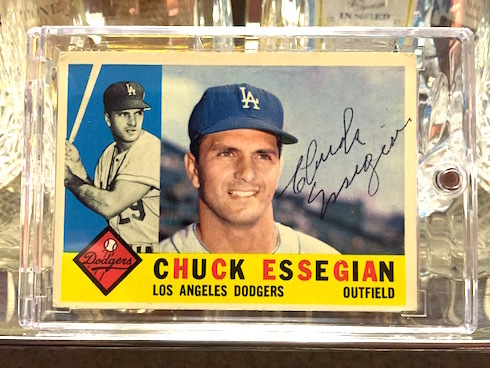 Sue	 01-04-2019 01-11-2019 Success 7 1/1 Sent a 1960 Topps - Wow! What a quick turnaround! Thanks, Mr Essegian! jmaciu	 08-17-2018 08-24-2018 Success 7 1/1 1960T. Love the black ball point signature. Thank you, Mr. Essegian!!! 1956WS	 06-27-2018 07-09-2018 Success 12 1/1 62T that he didn't sign last year. Asked for "1959 WS Champs" inscription. Got it in thin pen. Thank you, Mr. Essegian! JohnJM45	 06-19-2018 06-26-2018 Success 7 4/4 Sent 1959T and 3-1960Ts plus LOR and SASE. Received all 4 back, 2 signed in blue ink and no inscriptions. Thank you, Mr. Essegian. 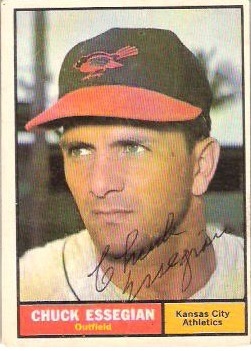 Rayjess1923	 05-14-2018 05-21-2018 Pending 7 1/1 91 Crown Orioles - signed in pen Thanks Chuck!!! RobHarrington	 11-13-2017 12-02-2017 Success 19 1/1 Signed one card. grapher0315	 05-11-2017 06-02-2017 Success 22 5/1 Signed 1/5, still very happy to add to my collection. Thanks, Mr. Essegian! 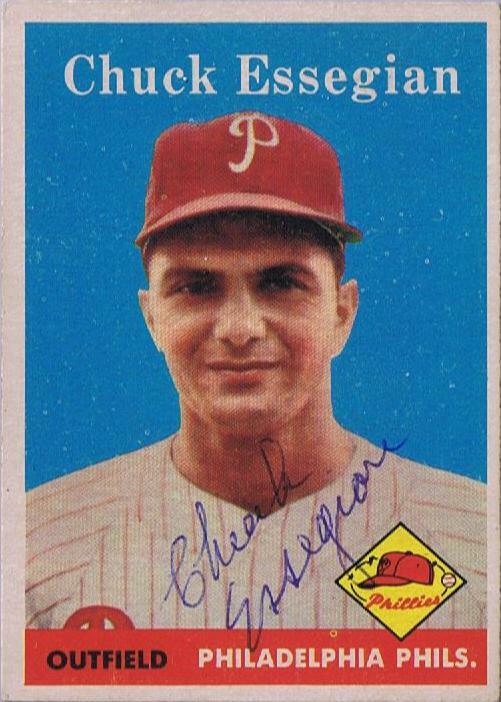 RobHarrington	 05-06-2017 05-11-2017 Success 5 2/1 1960 Topps signed in blue pen. 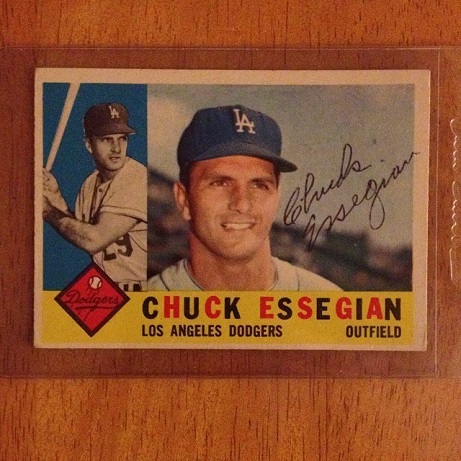 Sent back a 1958 Topps unsigned. 1956WS	 02-21-2017 03-01-2017 Success 8 2/1 1958 Topps. Didn't sign my 1962. Blue ballpoint. Thank you, Mr. Essegian! 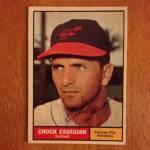 1956WS	 12-05-2015 12-21-2015 Success 16 1/1 1960 Topps. Thank you, Mr. Essegian! 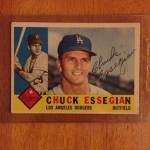 bicemusic	 04-03-2015 04-10-2015 Success 7 1/1 Sent 1 cards: 1961 Topps w/ LOR. Success! 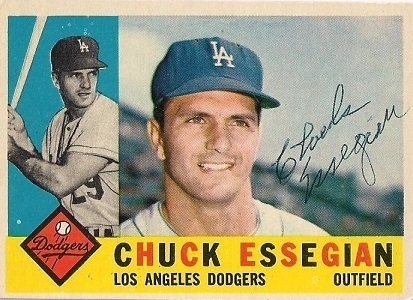 Thank you Chuck! 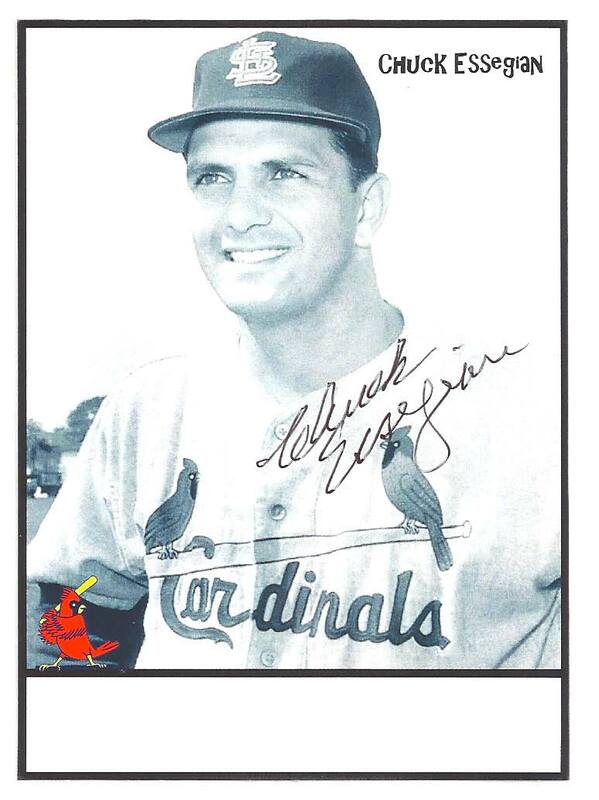 bicemusic	 01-22-2015 01-30-2015 Success 8 1/1 Sent 1 card: 60 Topps w/ LOR. Success! Thank you Chuck! white_rabbit	 12-13-2012 12-21-2012 Success 8 2/2 58T & 59T. Thanks a lot Chuck! 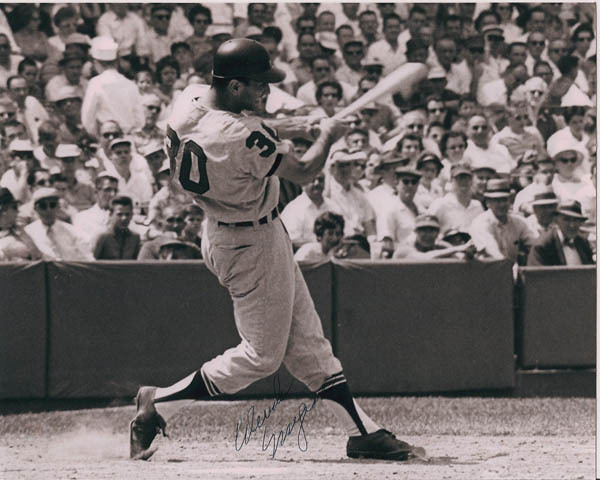 pktwsu99	 06-20-2012 06-29-2012 Success 9 1/2 sent a ROMLB for the '59 Series Champs project - signed and included a letter about how he has been to MT and my town, thanking me for writing to him. GREAT signer. brosenjill	 01-05-2012 01-12-2012 Success 7 1/1 My 1st TTM, can't wait to do more players. Thanks to Mr Essegian for a quick turn around on the card. lizard-jd	 09-08-2011 09-16-2011 Success 8 2/1 Signed one of my CIC & kept one. Wonder why it's so hard to get some players to sign in the obvious "white area"? 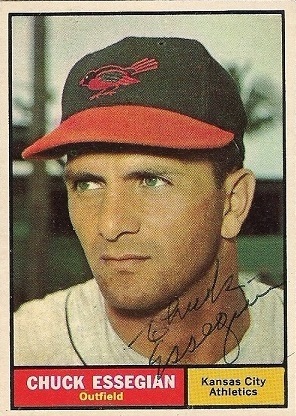 Waffle11	 08-16-2011 08-22-2011 Success 6 1/1 Sent 1960 Topps/Got card signed in black pen. Quick return, thanks! mmalpedo01	 04-10-2011 04-22-2011 Success 12 1/1 Upgraded a beat up 63. 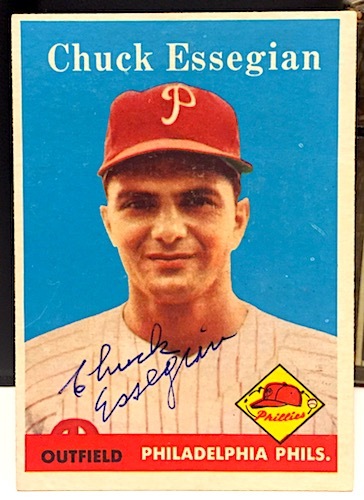 Signed my Sharp 63 Topps with black ink pen. mmalpedo01	 04-14-2010 04-30-2010 Success 16 1/3 Signed my 1963 Topps and both index cards used as backing. druce26	 04-07-2010 04-15-2010 Success 8 1/1 Chuck signed my 58 Phillies team photo!